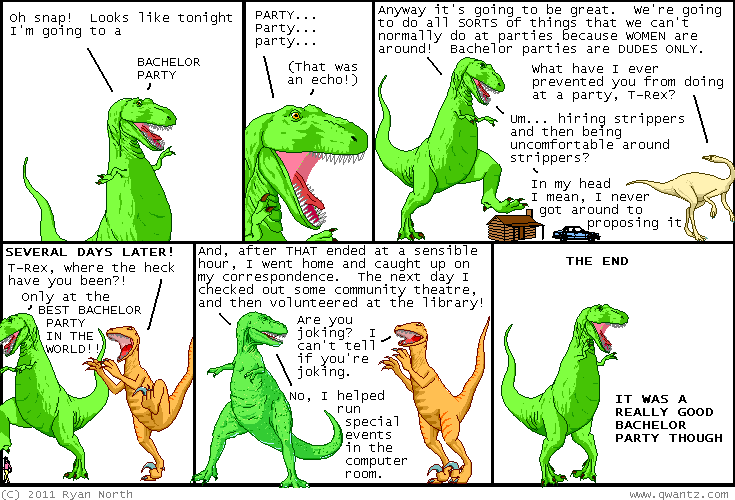 Dinosaur Comics - May 30th, 2011 - awesome fun times! –I cleaned the chicken sauce off my face really well! May 30th, 2011: Tattoos don't really hurt that much. It's less pain than a needle, but it lasts a lot longer, so I guess actually they hurt quite a bit but it's not like you can't just grit your teeth and say "That all you got?" One year ago today: always really reluctant to remix a previous comic but in this case it involves burgers, and who doesn't never not dislike liking burgers? ?